Steve Keene’s Modular Synthesis will be on view at Subliminal Projects from January 16 – February 13, 2016. This show will mark the Los Angeles debut of Keene’s Tattooed Plywood series and will include an environmental retrospective of Keene’s signature hand painted multiples. Modular Synthesis includes more than sixty, 32” x 48” of Keene’s Tattooed Plywood pieces, hand made furniture and several hundred Hand Painted Multiples. The Tattooed Plywood series, which include irreverently titled playing cards carved out of ½” plywood will be mounted via a custom SK Art produced, one-of-a-kind frame. These robust creations stand alone and provide easy mounting. No additional framing needed. The Hand Painted Multiples are tributes to some of the most important album art of all time including pieces in honor of The Rolling Stones, The Clash, Dylan, Joy Division and others. The 3D Furniture, fashioned out of Tattooed Plywood, is designed to enhance the experiential aspect of show. Gallery goers will be encouraged to sit and absorb themselves in the environment. A trained screen printer by trade, these hand painted multiples represent Keene’s version of poster art which has endeared him to the Flatstock community as an honorary member for the past 35 years. These affordable art staples of his repertoire have made him off limits to many galleries for obvious reasons. It is with great pride that Keene will present at Shepard Fairey’s gallery, a long time fan of his work. 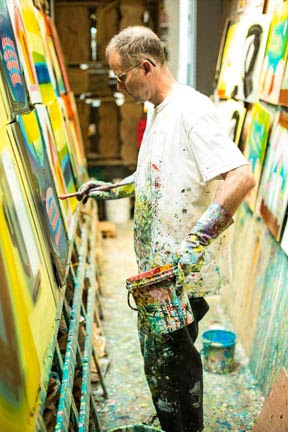 Having produced for sale over 300,000 Hand-Painted Multiples, Keene is the most productive artist of this medium of all time. Though Keene earned his MFA from Yale, his sensibilities lie somewhere between environmental architect, woodworker, and classical painter. “After two exhibits at The Santa Monica Museum of Art (2008 and 2011), its super exciting and appropriate to show the Los Angeles premiere Keene’s Modular Synthesis at Shepard Fairey’s Subliminal Projects gallery,” States Daniel Efram, show curator. Having solo shows gallery in Germany, Australia and in several other U.S. cities, Modular Synthesis at Subliminal Projects marks his gallery premiere in the Los Angeles area. Keene has had two previous exhibitions at the Santa Monica Museum of Art in both 2000 and 2008.